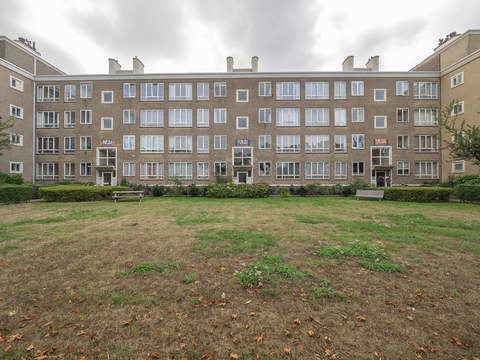 Populierstraat 107 Price asked € 315.000 k.k. Completely renovated cozy, well insulated and spacious four-room apartment with spacious back garden located between the Hanenburglaan and Wilgstraat. Entrance, vestibule with draft door with panes, spacious hallway, walk-in closet, fixed cupboard with connection for the washing machine, bright bedroom approx. 3.30 x 3.04 with fixed cupboard, spacious modern bathroom approx. 3.02 x 2.48 with bath, bathroom furniture and walk-in (rain) shower, spacious toilet with hand basin, spacious bedroom at the back approx. 4.12 partly 3.35 x 3.84 with fixed cupboard and French doors to the back garden approx. 13.80 x 6.60 partly 5.10 partly 3.75 with 2 terraces with morning and evening sun, stone shed with electricity. From the hallway French doors with panes to cozy living room approx. 12.51 x 3.46 partly 2.57 with white gloss kitchen unit with black stone worktop with sink, dishwasher, 5-burner gas stove, fridge and freezer (3 drawers) and French doors to the back garden . Sewerage charges 2017 € 137,05 per year. 2/9th share in the community. Active Owners Association, contribution € 50,-- each month. Electricity 8 groups with circuit breaker. Central heating system, brand Intergas, built in 2016. The condition of the bathroom and the kitchen is good/excellent. The condition of the interior is good/excellent and the exterior good. The apartment has wooden window frames with double glazing. The apartment has oak wooden flooring. Living surface approx. 98 m². The volume of the apartment approx. 378 m³. Near many shopping areas as: Fahrenheitstraat, Thomsonlaan, Goudsbloemlaan, Weimarstraat, Reinkestraat and Frederik Hendriklaan. Sports facilities including tennis, football, fitness, hockey, horseback riding and handball. Segbroekpark, Bosjes van Poot, Bosjes van Pex and dunes, beach and sea !! Public transport (RandstadRail Line 3, tram 11 and 12, bus 21 and 24) main roads through Hubertustunnel and A4/A12. European School of The Hague, primary schools and various schools.